As authorised swimming pool heating experts for Certikin in Buckinghamshire, Hertfordshire, Bedfordshire, Berkshire, Oxfordshire and the Greater London area, Heathcrest are the first point of call for many. 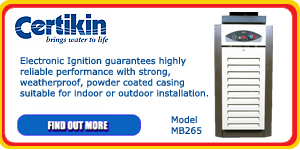 Certikin build a variety of superb heating systems, designed to suit a wide range of applications. The MB 185/265/405 model heaters are very economical to fit as they do not require the additional installation of heat sinks. This is because the alumina silica combustion chamber does not retain heat when the heater shuts off. It is no surprise therefore that these energy smart Certikin heaters, consistently achieve very high efficiency ratings. 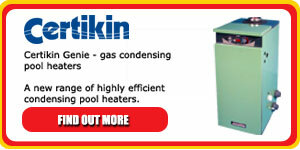 The Certikin MB 185/265/405 heaters with EconoTherm heat exchangers and UniTherm Plus system are designed to last longer and deliver more heat to your pool or spa water, for each unit of fuel, than any other alternative products on the market. With many years of experience in designing, engineering, and manufacturing all types of residential and commercial pool, space, and hot water heaters, Certikin’s swimming pool gas heaters have an enviable reputation and a huge number of very satisfied clients. In the British climate such systems work hard and correct regular maintenance can save a great deal of money and inconvenience. Heathcrest swimming pool heating maintenance contracts ensure that you get the best from your pool and that correct safety precautions are adhered to. These are specialised systems that need to be maintained to the highest standards and require expert knowledge at all times. If you have a pool or are considering installing one, call us for a free consultation, we are just a phone call away! We not only service and repair Certikin systems, we also repair and service a wide variety of other systems. Even if you have difficulty tracking down parts yourself, it is always worth asking us for help!